Tall Italian cypress or willowy weeping birch, lacy Japanese maple, or fragrant sweet bay - trees bring natural grace wherever they grow. 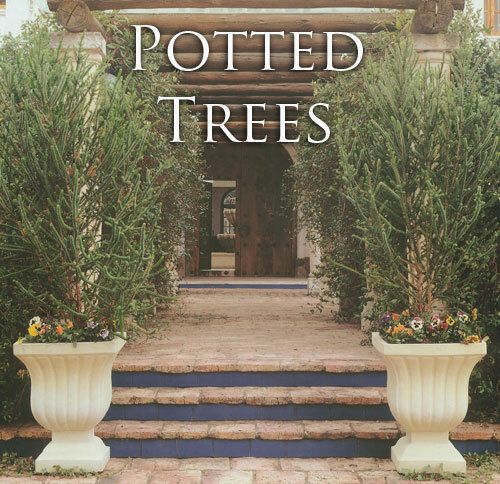 Container trees modest in height, yet still tall enough to look dramatic, can enhance even the smallest entryway, patio or balcony. Decked out in green all year long, potted conifers and other evergreens create a lush background for blooming annuals and perennials. Many deciduous trees stage seasonal spectacles worth showing off to friends. Blazing with color in autumn and elegantly bare branched in winter, they burst into bloom come spring, then spend the summer in leaf. Trees bring more than good looks to their surroundings, they help to shelter the places where they grow. 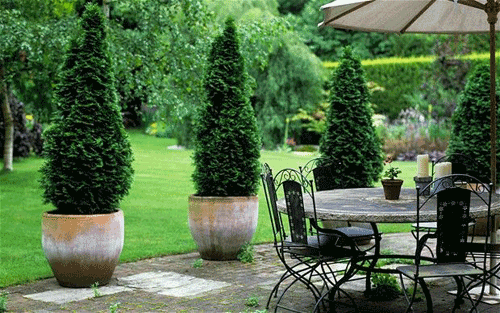 With proper care most slow growing small trees will prosper in large containers for years. Make sure your choose a container that is large enough for your tree. Any container - no matter how large - slows a trees growth and limits the height it can achieve. For example a tree that grows 30 feet may only grow 8 to 10 feet in a garden pot. The best time to plant a tree is early autumn. Most trees perform best in a mix of one part garden loam to tow parts potting soil mix. Keep soil slightly on the dry side, but deep water. Apply fertilizer once in spring and once again in summer. During the first years, even a small tree may be top heavy. Use a stake to help for support. 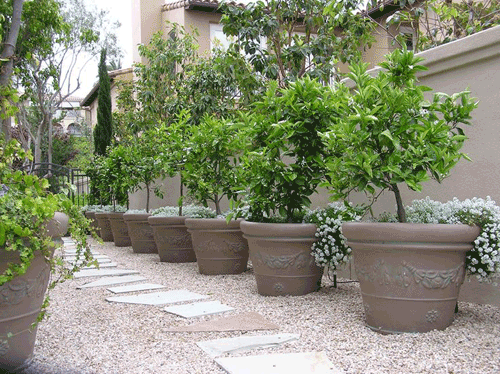 Most garden containers can be used for tree potting. We like a durable pot like ceramic, concrete or poly resin instead of a pot like terracotta that will break down over time. Try to choose the largest you can handle so that you don't have to worry about transplanting for a couple of year. Below are a suggestion of some trees that we like and work well in containers. Read more.....Planting a water garden.